How do you delete all messages on lg 500g instead of one at a time? This questions comes up every now and then with LG phones because you need to scroll down to see the menu option. Go to Menu -> Messages -> Inbox and select Options. 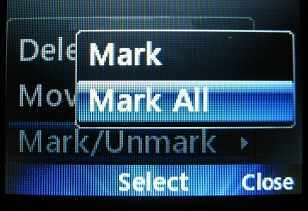 Then scroll down until you get to Mark/Unmark and select it, then select Mark All. That will select all the messages. 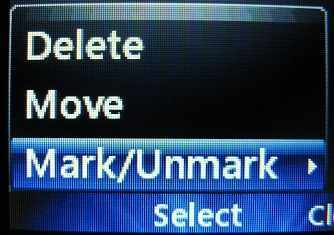 You can then delete all or individually unmark any you want to save and then delete all your unwanted messages. These instructions are for deleting text messages not voicemails. The instructions for doing that do mention that you have to scroll down to see the mark/unmark option. To delete voicemails, you have to check your voicemail and and use the voice prompts to navigate around the voicemail menu. THERE IS NO MARK/UNMARK ON MY lG 500g phone underinbox options.. I've been trying for years to figure out how to delete all of my old messages. Thanks to your instructions I just deleted 400+ old messages. Thanks so much for the helpful message on deleting messages. It was pretty slow doing it one at a time! Thanks for this VERY helpful hint....I have been trying to figure out how to free up space by deleting all messages at once for a while now! "My wife suggested that I Google my problem . . ."
I felt sure that there had to be a way to delete all messages, but could not figure it out. My wife suggested that I Google my problem, and presto, there you were! Thank you, thank you! Thank you, I finally got rid of hundreds of messages. Thank you for posting this I was getting tired of deleting them one at a time. The book did not show how to delete the text msgs so I was deleting them one by one. I was telling peple not to text because I had a crappy $30 phone from Net10 and had to delete each text one by one. I was back on the delete text one by one again until I did a Google search and found this site. Well thank God for you putting the answers on here. My fingers will no longer hurt and I can have about 20 minutes back to my life. Thank you, very useful, I was struggling to find a way and the manual is pitiful. You are a champ as in the manual it does not tell you how to delete more than one msg at a time. Thank you. Thank-you!! I knew there had to be a way! Thank you. Had another LG before this and it was simpler, just delete all with the delete button. This is the correct solution for the lg500g. If there are no messages in your inbox, outbox etc. you won't see the mark/unmark option. There has to be be something there to delete before that option is available. @Anonymous: click on whatever file you want to clean out ( inbox, outbox, etc ). Click OPTIONS. Go allll the way to the bottom of the OPTIONS menu and you should see Mark/Unmark with an arrow pointing to the right indicatin g a dropdown menu. Go to the dropdown and select MARK ALL. Then OPTIONS and DELETE. This will delete all of the messages. You'll get a pop-up asking if you want to delete ( number ) messages before they are deleted. Not visible on the list of options until you scroll all the way down (or up). I am so happy I came across this site. Have been deleting one at a time and thought there had to be a better way. Says nada in manuals. THANKS ALOT! I am so glad I found your page. Neither Tracfone nor LG were able to tell me how to do this. Once on your site, I was able to delete those pesky messages. Thank you! We need geniouses like you to help us out! Thanks again!! Thank you!!!! It was a chore to clean out the messages. The instruction book is not very good. Why don't they put the obvious up front in the manual??? Thanx for showing me how to delete all messages. Info with the phone doesnt tell you anything about anything. THANK YOU SO MUCH! Thanks so much I appreciate your help!